Actually, yes it would reduce demand for real rhino horn. These two products are substitutes, and nearly perfect ones at that. This is quite literally Econ 101. The second part of the statement is simultaneously less wrong and more ill-founded. It’s not wrong, in the sense that I am sure no one has systematically studied whether access to synthetic rhino horn (a product that does not yet exist) helps give people stronger preferences for the “real thing” (a product that is illegal and must be damnably hard to do research on). But this objection is based on nothing more than idle speculation. And, importantly, questions arise as to how law enforcement authorities will be able to detect the difference between synthetic and real horn, especially if they are sold as powder or in manufactured products. What she is proposing is the ideal outcome for the synthetic-horn intervention. They are going to sell the fake stuff at one-eighth the price of real horns. If the difference is undetectable, that would eliminate the strong incentives poachers have to kill rhinos. I am not claiming that none of these things will happen a little bit. Rather, my point is that for Pembient’s plan to be harmful on net, all of these other potential effects that Ellis came up with – the idea that synthetic rhino horn is somehow not a substitute for real horn, that it is a “gateway drug” to the real thing, and that it would provide a way for real horn purveyors to hide their ill-gotten goods – would have to overwhelm a massive drop in price for rhino horn, which would drastically reduce supply of the real, more expensive thing. The alternative is the status quo: we stick with the existing strategies we are using to combat rhino poaching. Let’s take a look at how that is working out. 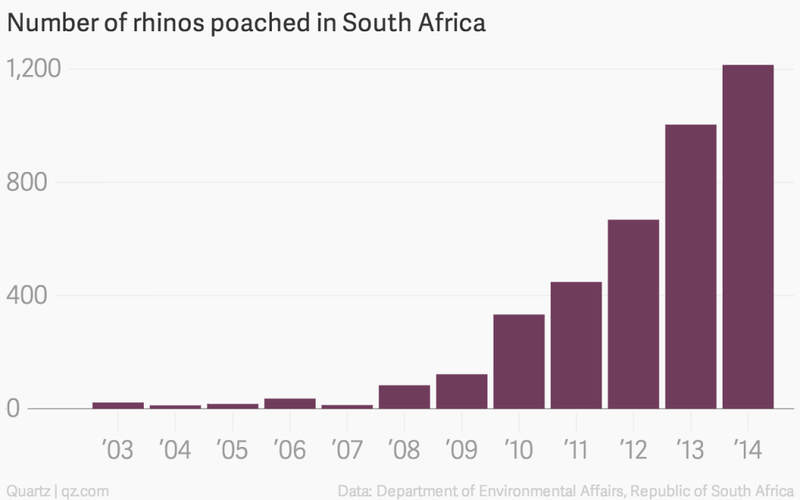 The following graph, from the original Quartz piece, shows the annual number of rhinos poached each year in South Africa. As a percentage of total living rhinos in the world, these numbers are terrifying. There are about 20,000 rhinos in Africa today, according to the most recent counts I could find on Wikipedia (white rhinos black rhinos). If this rate of increase in poaching continues, both the white and black rhino will be driven extinct within our lifetimes. We need to do more than staying the course and hoping for the best. And anyone who wants to object to actual solutions people propose for this problem should base their complaints on sound reasoning and real evidence.